Many references and quotes throughout this website will be to St. Bonaventure, a member of the Order of Friars Minor (OFM) and Minister General of the Order. He wrote some very important works, especially important readings for Franciscans, including The life of Saint Francis, The Soul’s Journey to God and The Tree of Life . He added greatly to our understanding of Franciscan spirituality. St. Bonaventure, known as “the seraphic doctor,” was born at Bagnorea in Tuscany, in 1221. He received the name of Bonaventure in consequence of an exclamation of St. Francis of Assisi, when, in response to the pleading of the child’s mother, the saint prayed for John’s recovery from a dangerous illness, and, foreseeing the future greatness of the little John, cried out “O Buona ventura”-O good fortune! At the age of twenty-two St. Bonaventure entered the Franciscan Order. Having made his vows, he was sent to Paris to complete his studies under the celebrated doctor Alexander of Hales, an Englishman and a Franciscan. After the latter’s death he continued his course under his successor, John of Rochelle. In Paris he became the intimate friend of the great St. Thomas Aquinas. He received the degree of Doctor, together with St. Thomas Aquinas, ceding to his friend against the latter’s inclination, the honor of having it first conferred upon him. Like St. Thomas Aquinas, he enjoyed the friendship of the holy King, St. Louis. A humble man, John Duns Scotus has been one of the most influential Franciscans through the centuries. Born at Duns in the county of Berwick, Scotland, John was descended from a wealthy farming family. In later years he was identified as John Duns Scotus to indicate the land of his birth; Scotia is the Latin name for Scotland. In Scotus’s time, some philosophers held that people are basically determined by forces outside themselves. Free will is an illusion, they argued. An ever-practical man, Scotus said that if he started beating someone who denied free will, the person would immediately tell him to stop. But if Scotus didn’t really have a free will, how could he stop? John had a knack for finding illustrations his students could remember! Drawing on the work of John Duns Scotus, Pope Pius IX solemnly defined the Immaculate Conception of Mary in 1854. John Duns Scotus, the “Subtle Doctor,” was beatified in 1993. Father Charles Balic, O.F.M., the foremost 20th-century authority on Scotus, has written: “The whole of Scotus’s theology is dominated by the notion of love. The characteristic note of this love is its absolute freedom. As love becomes more perfect and intense, freedom becomes more noble and integral both in God and in man” (New Catholic Encyclopedia, Vol. 4, p. 1105). Intelligence hardly guarantees holiness. But John Duns Scotus was not only brilliant, he was also humble and prayerful—the exact combination St. Francis wanted in any friar who studied. In a day when French nationalism threatened the rights of the pope, Scotus sided with the papacy and paid the price. He also defended human freedom against those who would compromise it by determinism. Ideas are important. John Duns Scotus placed his best thinking at the service of the human family and of the Church. 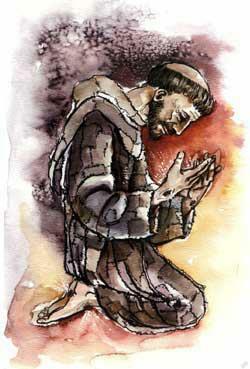 St. Francis often called himself an “idiot,” that is an uneducated man. But whether he was inferior intellectually in wisdom to so many of his famous “educated” sons is a question open to considerable doubt, particularly when we consider that extraordinary relation between him and the Immaculate. And if indeed not only his Order, but Francis himself was chosen by Mary Immaculate to trace out a very clear form of life including as one of its essential elements a very specific cultivation of the intelligence for a very definite intellectual, then we are in a better position to understand a rather surprising phenomenon: the two friars of the first century of the Order’s existence best known for sanctity are also Doctors of the Church; namely, Sts. Anthony and Bonaventure. And the friar who, in the estimation of many sound critics stands at the pinnacle of refined metaphysical reflection within the Franciscan tradition, John Duns Scotus, is a candidate for canonization. Most people on consideration would have no insuperable difficulty in admitting the profound influence of St. Francis on the subsequent course of theology, nor of appreciating the spiritual and pastoral affinity between Francis on the one hand and the theological work of Anthony and Bonaventure on the other. In the case of Bonaventure, it is generally admitted today that the influence of Francis is a main source for the key orientations of the Seraphic Doctor’s doctrinal synthesis. This morning, after several Catecheses on various great theologians, I would like to present to you another important figure in the history of theology. He is Blessed John Duns Scotus, who lived at the end of the 13th century. An ancient epitaph on his tombstone sums up the geographical coordinates of his biography: “Scotland bore me, England received me, France taught me, Cologne in Germany holds me”. We cannot disregard this information, partly because we know very little about the life of Duns Scotus. He was probably born in 1266 in a village called, precisely, “Duns”, near Edinburgh. “Jesus was not an after-thought that happened because mankind did not keep our part of the covenant with God. Sin was not the reason for Jesus, and nothing man could have ever done could force God to act. The Incarnation was not a reaction, but the initial action that caused creation in the first place. In other words, the Incarnation was not God’s “plan B” set into motion after “plan A” failed. The whole purpose of creation is for the Incarnation, God’s sharing of life and love in a unique and definitive way. God becoming human is not an afterthought, an event to make up for original sin and human sinfulness. Incarnation is God’s first thought, the original design for all creation. The purpose of Jesus’ life is the fulfillment of God’s eternal longing to become human. In other words, even if Adam and Eve had not sinned, God would have sent his Son into the world as that was his plan from the beginning. Sin was not the reason for the Incarnation. It was the result of God’s love and free choice. There are two main theologies in the Catholic Church: (1) the primary theology adopted by the Church (i.e. The Work of the Dominican School) and (2) the alternate theology in the Church, (i.e. The Franciscan School). In other words, God sent his Son into the world because of the sin of Adam and Eve and to redeem us from original sin. Jesus is seen as the expiation for sin. If Adam and Eve had not sinned, the thinking is that there would have been no need for the Incarnation, for Jesus to be born and to die on the cross. Original sin is not the reason for the incarnation. The reason is God’s love and free choice. The incarnation would have taken place even if man had not sinned. It was God’s plan from the beginning that Jesus would come to be with us because of love. Based on Jesus always being the blueprint and basis for creation. It was always God’s plan in the fullness of time to Incarnate. Original sin is not the reason for the presence of God-with-us in human reality and history (Incarnation). God’s love and free choice is! The Franciscan view of creation moves sin out of the forefront and replaces it with overwhelming love of a Creator overjoyed and passionately in love with creation. The Franciscan school kept alive the radical love-centered image of God. The following is excerpt from Understanding Franciscan Theology, Tradition and Spirituality referred to above. Blessed John Duns Scotus, OFM, was one of the more important theologians and philosophers of the High Middle Ages. He was nicknamed Doctor Subtilis for his penetrating and subtle manner of thought. Scotus has had considerable influence on Catholic thought. The Incarnation is not a divine afterthought or reaction to any event, but the cornerstone of the whole plan of creation. Everything that was, is and ever will be is based in Christ. The relationship between divinity and humanity, God and humanity, are intrinsically united and all creation is centered on Jesus. Creation is based upon God’s absolute freedom and love, e.g. God’s very nature, and not a need.